The Zambezi River cuts its way through Zambia and Zimbabwe forming the border between the two countries at Victoria Falls, and is one of the seven natural wonders of the world. At Victoria Falls the Zambezi plunges one hundred meters into the Batoka gorge and offers one of the best single day white water kayaking trips to be found any where in the world. Warm water, big rapids, great paly features and an abundance of culture makes the Zambezi a classic kayaking destination. The trip will be a combination of day trip paddles in the famous Batoka gorge and an overnight safari to Chobe national park in Botswana. 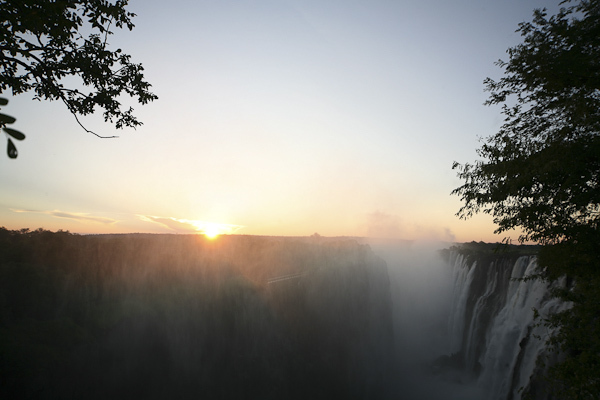 The majority of the trip will be based in Livingstone, Zambia’s adventure capital. Livingstone hosts an abundance of local markets and various sight seeing activities, bars and restaurants. The Zambezi River below Victoria Falls offers some of the best class III & IV big water kayaking in the world. Warm water, big rapids and great play features are the trademarks of the Zambezi River. Day 8-12 Running sections of the Zambezi, developing big water skills set & having the time of your life. Zambezi Adventure takes place on Class III/IV whitewater. The Zambezi Adventure is suitable for experienced paddlers who are able to paddle for 4 – 6 hours in a day on Class III/IV. Generally the river is accessible by foot and is far road access, and there will be some exposed terrain. This trip begins on an easier section of whitewater, but will soon reflect conditions expected at the grade. Participants should therefore expect to be in a river environment during for sometimes extended periods of time. The Zambezi trip is aimed at intermediate and advanced white water paddlers who have a roll, and who are looking for an adventurous kayaking and cultural experience on one of the best white water rivers in the world. * The Zambezi Adventure meets in Livingstone. At the end of the Adventure, we’ll arrange your drop off for the airport in Livingstone. You don’t need to rough it to get the African experience. We’ll be staying in first rate local accommodation and all the food will be fresh and hygienically prepared.